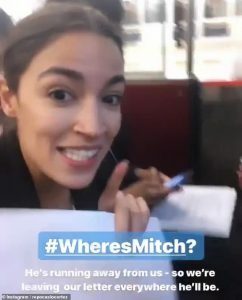 Where is Mitch? He can't be found. The Dems have looked. He's not around. But they can't find him any place. So up and down, and hither and yon. He's on the loose or in the john. They've given up without a sighting. And never found where he is hiding. they do not find him anywhere! Mitch is only the pro at not putting something on the floor. Apparently, himself, too. You made me laugh once more, my friend. Laughter is good medicine, especially before surgery. Thanks.